Cost: Small eats are priced from £3.75 to £7.95, burgers from £10.95 to £11.95. Steaks range from £14.50 for a 220g cut of rump, to £38.50 for a 600g cut of top rump, while the Cau feasting plate, with 1.2kg of meat for sharing between two, weighs in at £84.95. Aside from steaks, there are fish, pork and vegetarian mains ranging from £9.95 to £15.25. Sides are £2.95 to £3.95. Cocktails are all priced at a reasonable £6.25, and the wine list is mostly Argentinian, but with entry level options including a Yecla Macabeo white and a Finca Valero Carinena red, both from Spain, and priced at £17.50 each. About: The sister restaurant to the Gaucho group, this chain of restaurants is a less ostentatious version (no calf skins on the walls or chairs here), but serving a similar quality of Argentinian beef. It has branches across the UK. The restaurant overlooks the lovely St Katherine’s Dock by the Tower of London, making for a beautiful setting. Inside, the decor is simple, with charcoal grey floor tiles, white chairs and black wooden tables, and walls clad in corrugated sheets of shiny white plastic. On the evening we were there, the restaurant was busy with a mixed clientele ranging from City types to 20-something diners. What We Ate: From the small plates menu, we started with the salt and pepper squid (£5.95), served with chilli and spring onion, and chipotle mayo. This was very good, crispy but with deliciously tender squid. Also good was the belly of pork tempura (£7.95) - meltingly tender pork belly in a thin crispy batter. Delicious as it was, it had little resemblance to tempura, being made with a standard fish-and-chip style batter rather than a superfine crispy tempura batter. It was served with 'CAUchup' - a spiced tomato ketchup with a dominant, perhaps excessive, flavour of cloves. Moving onto mains, tempting though the other options were, we plumped for the 1.2 kilo Cau feasting plate (£84.95), and what a feast it was! With 400g each of lomito, asado de chorizo and tira de ancho cuts, it was easily enough for 3 or even 4 people. The lomito is a fillet of rump, said to combine the flavour of the rump and tenderness of the fillet, and was served at Cau with a delicious blue cheese sauce. The asado de chorizo was a sirloin steak in a churrasco marinade of smoked paprika, aji molido (crushed chillies), garlic and parsley. This was a good cut of beef, although I thought it was a little overpowered by paprika. The tira de ancho was a spiral cut of rib-eye, marinated in chimichurri and grilled slowly. Perfectly cooked, medium rare, this was excellent, and my favourite of the three. To accompany, we had some very good, triple-cooked thick cut chips. The truffle mac'n'cheese had a delicious truffle aroma, but the macaroni was sadly lacking in both cheese and salt. For dessert, we had the churros (£4.95) - Argentinian-style doughnuts, dusted with cinnamon sugar and served with dulce de leche. Dr G opted for the alfajores ice cream sandwich (£5.95). This was a dulce de leche ice cream sandwich made with Argentinian cookies and desiccated coconut. The dessert was intensely sweet but authentically Argentinian, and reminded me of desserts I had a few years ago in Buenos Aires. 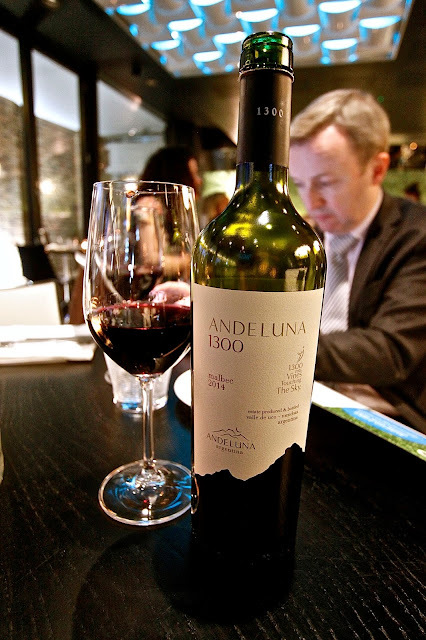 What We Drank: We shared a bottle of Andeluna 1300 Malbec 2014, Mendoza, Argentina. £29.50. This was a full-flavoured, straightforward wine with plenty of blackberry fruit, soft tannins and an easy-drinking finish. With dessert, we had a glass of Susana Balbo late harvest Torrontes 2010 from Argentina (£5.50 for 50ml). With honey and jasmine on the nose, this sweet white wine had luscious sweet fruit but I thought it lacked balancing acidity. The Zuccardi Malamado Port-style Malbec from Argentina (£4.50 for 50ml), had a lovely weight of intense, sweet blackberry fruit. Likes: The quality of the beef served at Cau is very good, the pork belly tempura and salt and pepper squid too. Service was friendly, well- informed and entertaining. There is a lovely view over St Katherine's dock. Dislikes: The only snag we had during this meal was the mac’n’cheese. I love this dish when it is well made, but Cau’s lacked flavour and needs looking at I think. Verdict: Cau is a casual restaurant serving good quality, well-cooked beef at reasonable prices. Cocktails are also commendably affordable. Great service and location. Recommended. For me, something about this restaurant reminds me of a science fiction film. The steaks however are amazing! Are you a cruiser? Find out here. The New Yauatcha City - "Better Call Lim!"